Article courtesy of NCWV Media - The Republican. Staff Writer: Renee Shreve. Photo Credit: Leslie Mulliken. Garrett County’s 2017 Most Beautiful Persons are a couple — Crystal and Brian Boal of Oakland. The announcement was made during the Garrett County commissioners’ public meeting Monday afternoon at the courthouse in Oakland. The standing-room-only crowd included Sen. George Edwards and Del. Wendell Beitzel. Five nominations were submitted for the 2017 award. The Boals were nominated by Liz Gilbert on behalf of the Our Town Theatre board of directors. Gilbert noted they volunteer their time and talents to local schools and their church, and that Brian is a member of numerous boards, foundations, and such organizations as Christian Crossing and the Oakland/Mtn. Lake Park Lions Club. Landon’s Library was established in memory of their son. “Landon’s Library, now in its 11th year, invests 100 percent of its donations to monthly books through the Imagination Library, play dates, Kindermusik classes, a youth basketball league, and the Learning Beyond the Classroom bus, all benefiting Garrett County children and families,” Gilbert wrote. In 2009, she noted, the Boals partnered with Dolly Parton’s Imagination Library, whereby a book is mailed to a child every month from birth through age 5. The program is funded 100 percent by Landon’s Library and, to date, has distributed more than 100,000 children’s books. “Crystal and Brian invest their warmth and goodwill, resourcefulness, and generosity for the benefit of all of us,” Gilbert wrote. 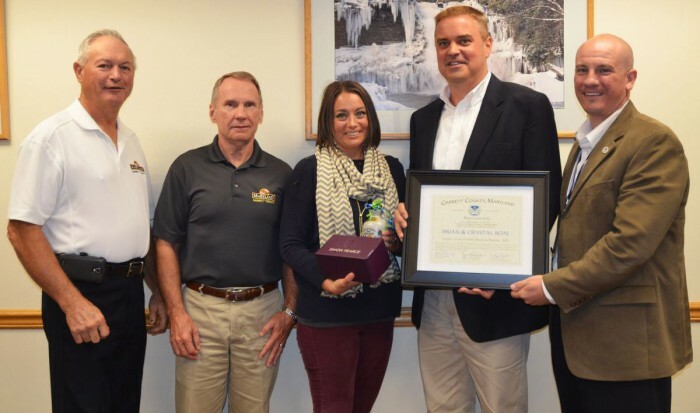 The commissioners presented the Boals with a certificate, a commemorative piece of Simon Pearce glassware, and a container of Steyer Brothers maple syrup. Sen. Edwards and Del. Beitzel also presented them with resolutions from the state Senate and House of Representatives in recognition of their many contributions. Edwards expressed his appreciation to all of the nominees. “Without you, we wouldn’t get a lot of things accomplished,” he said. Beitzel also commended those who submitted the nominations so the volunteers could be recognized for their contributions to the county. “It’s an honor for me to represent such wonderful people in Garrett County as their delegate,” he said. Also nominated for Garrett County’s Most Beautiful Person were Hilda Maust, Bill Lohr, the Oakland/Mtn. Lake Park Lions Club, and Daniel Clark. Maust, who turned 84 on Monday, was nominated by Debbie Workman/Hospice of Garrett County. Maust became a patient care volunteer for Hospice in 2000 and has contributed more than 2,500 hours of caring, according to Workman. Nominated by Sandy Bell and Carolyn George, Lohr’s many volunteer efforts include transporting people to doctor appointments, giving away produce from his own garden, planning and cooking meals for fundraisers, and promoting the Bone Marrow Donor program. The Oakland/Mtn. Lake Lions Club was nominated by Eric Robison. Founded in 1940, the club holds numerous fundraisers throughout the year to assist efforts that benefit local residents, including vision screenings, Cindy’s Fund, Landon’s Library, Special Olympics, Boy Scouts, and the Deer Park Community Volunteer Fire Department. Clark was nominated by Ken Harris. “Daniel has been a positive role model for many of our youth over the last three decades,” Harris wrote. Clark was a Boy Scout Troop 22 scoutmaster, assisting many to achieve the rank of Eagle Scout, and has been assistant wrestling coach at Southern Garrett High School for many years. In addition, he is a blood donor and an active member of the Knights of Columbus. He noted that those who were not selected in the past can be nominated again for the award.